Birmingham is continuing to maintain its record-level of development across the city centre, according to a new study. Construction levels remained resilient last year with 24 new starts breaking ground in 2017, including four new office schemes adding to the city&apos;s development pipeline of 1.4 million sq ft.
Confidence in developing speculative office space has grown as pre-letting activity continues with 49 per cent of space under construction already let, according to the 16th annual Deloitte Real Estate Birmingham Crane Survey. Edwin Bray, partner at Deloitte Real Estate and author of the survey, said: "Over the past three years, Birmingham has witnessed a resurgence in development and, while many commentators expected to see a downturn in activity due to political and economic uncertainties, it is quite the opposite. "Investment in transport links and the much-anticipated HS2 have led developers to be more bullish in their approach and seize the opportunity to significantly refurbish and redevelop existing stock. "This has led to an increase in speculative builds such as the office scheme at Snowhill. "The city is quite rightly capitalising on its position and this renewed confidence has been further bolstered with the election of the new mayor, the promise of Devo 2 and the forthcoming 2022 Commonwealth Games. "HMRC&apos;s 25-year lease at Arena Central echoes the confidence of businesses investing in modern, flexible workspace for its employees with Birmingham the destination of choice." The city&apos;s residential construction has grown with 13 new schemes starting during 2017, up 30 per cent on the previous year, and set to deliver 2,500 new units in 2018 alone. Mr Bray added: "The confidence in the city centre residential market highlighted in last year&apos;s report has gathered pace and we are now seeing not just competition to secure viable sites but also a race to complete to meet the demands of first time buyers and investors. 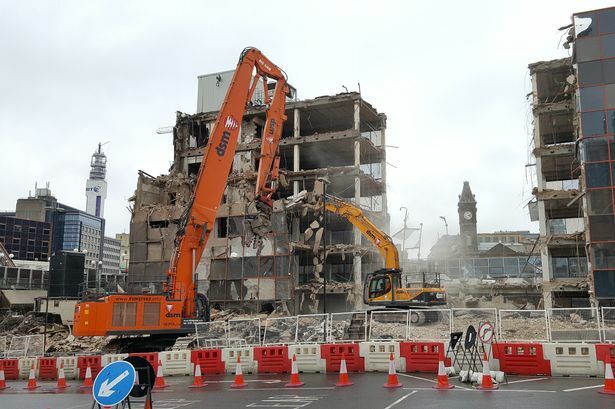 "At present, there are 4,078 residential units under construction across the city, with several re-designing Birmingham&apos;s skyline. "The 31-storey apartment block at the junction of Sheepcote Street is the tallest new building in the city but this will be eclipsed by the 42-storey building at 2one2 Broad Street." For the fourth successive year, there has been considerable development activity in student accommodation with four new schemes. The report said the hotel market in Birmingham had fared well in 2017, with occupation rates remaining high at 75 per cent. One new scheme started development in the past 12 months and the research also showed 334 new hotel rooms were completed in 2017, the highest volume since 2013. However, the development of education space, medical-related development and research facilities have fallen back. For the second year running, activity in retail has also been subdued with many developers focusing on large mixed-use developments. Mr Bray said: "The construction industry has battled with rising costs and dwindling skills but Birmingham is witnessing a renaissance and is delivering. "The development pipeline is healthy and what is exciting is the breadth of the development spread throughout the city."